Summary: There was a certain irony about these figures. 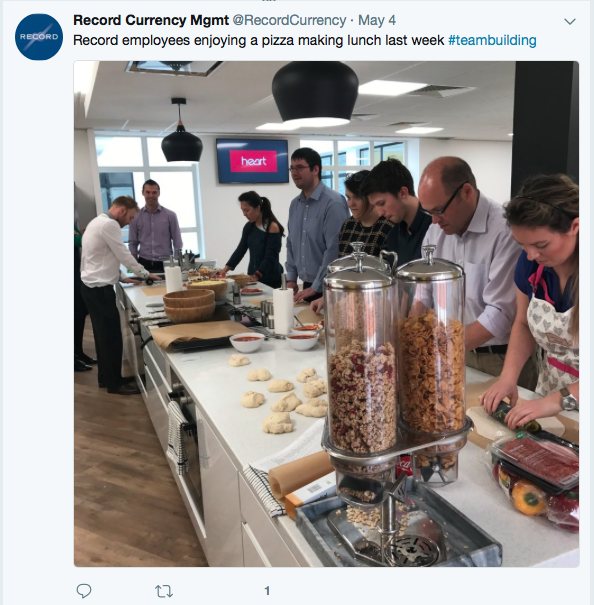 REC makes its money by managing currency movements for clients… yet the group itself has prospered of late largely because the weaker GBP has translated into greater management fees. Whether REC’s clients have actually prospered is harder to say, as there still seems little evidence of a growing customer base. Still, I welcome REC’s decision to hand excess cash back via larger dividends, but the accompanying £10m tender offer does appear as if it was devised primarily to help REC’s founder plan for his retirement. With operating costs expected to rise, too, I reckon the tender price equates to an underlying P/E of 14-15. I continue to hold. REC’s half-year statement and the firm’s subsequent quarterly updates (Q3 and Q4) had already indicated these results would not be too surprising. My guess at the interim stage was that earnings for the second half could run at 1.56p per share (3.11p per share annualised), and in the event H2 earnings came in at 1.58p to give full-year earnings of 2.91p per share. For the year as a whole, total revenue improved 13% while operating profit gained 26%. Excluding third-party investment gains, the underlying picture showed revenue up 7% to £22.7m and operating profit up 12% to £7.7m. “Constant innovation is key to meeting the needs of our clients in a challenging environment. One of the Group’s key strengths is its flexibility which is demonstrated in its capability to adapt products, processes or distribution methods, and to tailor its approach to suit individual client requirements. This innovation can be seen in each of our established products, where our strategy has been continually to enhance the value proposition offered to clients in order to resist competitive pressures on revenue margins. This is particularly true in the case of Passive Hedging, which can be mis-characterised by others as a commodity service, but which instead offers growing opportunities to save costs and add value for clients. Labouring through REC’s long-winded narrative about uncertain political and economic events, I was disappointed to discover such matters apparently provide only “opportunities to engage with clients”. The sad reality is that REC has for some years now talked of “opportunities to engage with clients”… but such opportunities have yet to push the group decisively forward with much greater revenue and profit. The fact that overall customer numbers improved by just one to 59 during the year suggests new clients remain as elusive as ever. REC described Passive Hedging income as “stable”, which is no doubt because large Swiss pension funds are required by regulation to use such hedging. For 2016, some 32% of revenue was derived from such Swiss clients and I dare say a similar proportion was received during 2017. When I studied November’s interims, my own fee-rate sums differed to those REC presented and I have therefore produced my own calculations again. The differences may look small compared to REC’s own figures, but they can carry a sizeable impact on REC’s possible earnings. What’s more, all the strategies are showing positive returns since inception. So clearly something has been going well — which makes the standstill client numbers all the more disappointing. Oh dear. 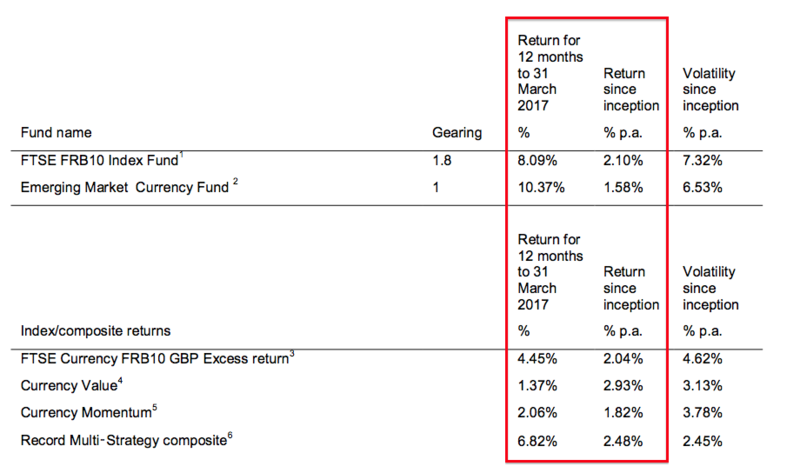 It appears as if 2017 was a freakishly good year for currency returns. I am now left wondering what exactly needs to happen for REC to attract new clients — at least on a ‘past performance’ returns perspective. One positive from the management narrative concerned new regulation. “Some of our clients were affected from 1 March 2017; many more clients will be affected from January 2018. At least that is something less to worry about (for now). 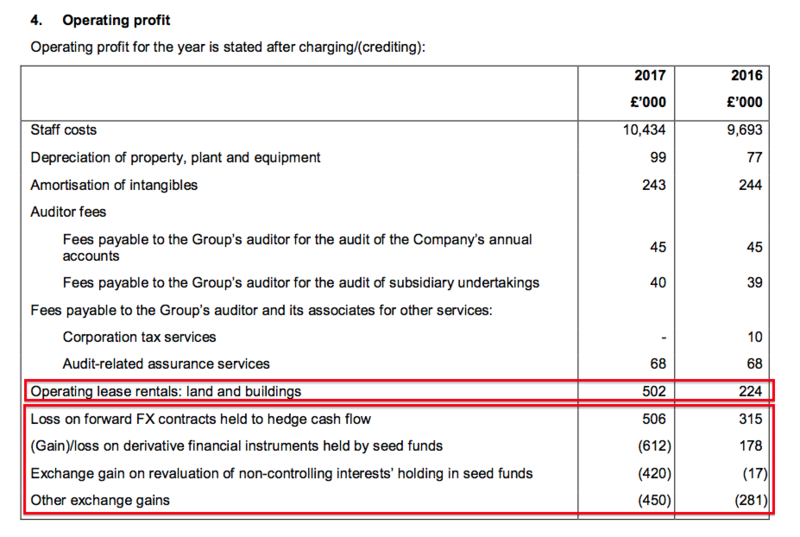 While I do like to whinge about REC’s lack of progress with its client base, you won’t find me complaining too much about the group’s financials. In particular, cash conversion is generally superb. The cash generation has allowed a substantial £17m to be distributed as dividends since 2013, while also adding a further £12m to the cash pile. Total year-end cash was reported at £37.2m, and that sum included regulatory capital of £8.9m and third-party money of £4.8m. The £23.5m balance is equivalent to almost 11p per share. Other positive ratios include the operating margin and return on average equity. Excluding investment gains, I calculate REC converts a hefty 30%-plus of revenue into profit. The firm also produces appealing levels of earnings from its small equity base. I should add that REC operates without any debt and does not have any defined-benefit pension obligations. The major development from last week’s RNS was REC’s decision to become a little more relaxed with its cash hoard. Squinting at the chart above, it appears one year’s expected overheads now come to £13m. Given REC said overheads for 2017 were £11.7m, I am disappointed additional costs still seem to be creeping into the business. Anyway, I was pleased the group said it would pay out all of its 2017 earnings as dividends — by lifting the full-year payout by 21% to 2p per share and distributing the 0.91p per share balance as a special payment. What’s more, REC also admitted it was contemplating a potential £10m return of capital back to shareholders. The £10m capital return was confirmed this week through a separate announcement of a formal tender offer. REC will acquire about 10% of its share count at around 45p per share. REC started hinting at a special dividend this time last year, so I am glad such a payment is finally on its way. iii) Earnings per share can be enhanced and help trigger associated board bonuses. True, some shareholders may prefer the taxation consequences of a tender offer. However, at least with a special dividend every shareholder has the choice with what to do with the handout. i) The effective 45p purchase price does not seem outrageously extravagant, although it does not reflect an obvious bargain either (see my Valuation notes below). ii) REC’s founder and non-exec chairman, Neil Record, has committed to sell between 7 million and 15 million of his own shares. With REC able to purchase a maximum of 22 million shares through this tender offer, Mr Record appears very keen for shareholders’ money to be spent acquiring part of his shareholding. Mr Record turns 64 on Sunday and I dare say this tender offer is part of his retirement planning. I just wonder if he could have raised even more money by selling the whole business instead. Mr Record’s holding will reduce from 32% to 27% of the company if he is able to sell the full 15 million shares. He will retain at least 56 million shares after the offer. One final thought on the larger dividends and tender offer — I do wonder if releasing so much cash signals REC has given up on any significant expansion hopes. After standard 19% tax, my new sums suggest earnings could be £6.1m or 2.74p per share. REC’s market cap at the 45p tender-offer price is £99m, which adjusting for the £10m earmarked for the offer gives an enterprise value (EV) of £89m or 40p per share. Dividing that 40p per share by my 2.74p per share earnings guess gives an underlying P/E of 14-15. While that rating is not outrageously extravagant for the tender offer, it does not strike me as an obvious bargain either. 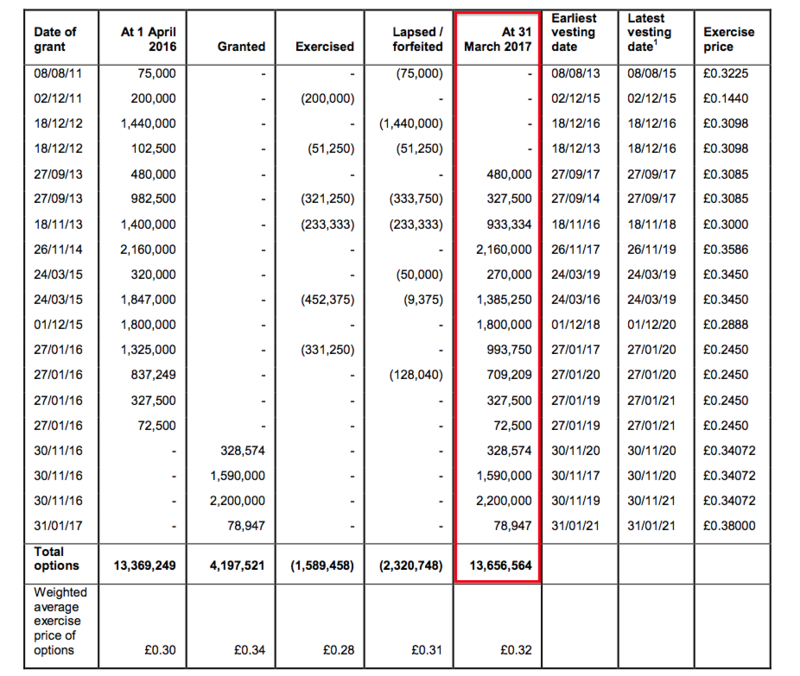 If you assume REC could have used £23.5m for the tender offer — to leave only the £8.9m regulatory-capital cash and the £4.8m third-party investments on the balance sheet — then the P/E drops to 12-13. 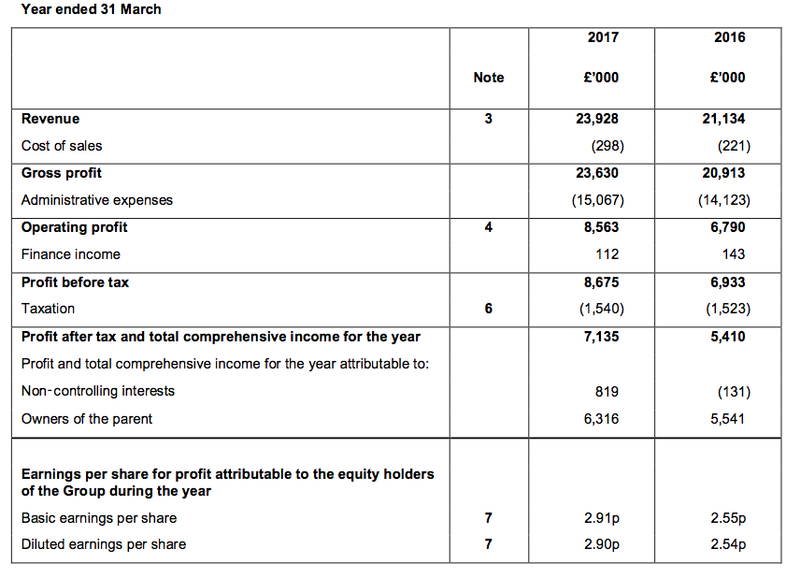 Meanwhile, REC’s lifted 2p per share ordinary dividend supports a 4.4% income. Credit to REC for publishing a full set of accounting notes within its results RNS. The forthcoming full annual report should include further information on director pay etc. Looking at the last four entries, which all seem to be non-trading items, they total a gain of £976k for 2017 versus a loss of £195k for 2016. So it appears the reported 2017 profit and overhead were flattered somewhat. Nice to see two of the newcomers were employed in Client Relationships, which I assume involves looking for new clients. The average cost of each employee was £143k and each employee produced an average £311k management fee. Those ratios are the highest since 2011. Staff costs as a proportion of management fees was 45.9% for 2017, which was a touch below the 46.3% for 2016, but above the 44.0% for 2015 and 2014. I would like to think this ratio will not advance much further. Some 52% of 2017 revenue was received from the group’s five largest customers. At least this ratio is less than the 60.1% seen for 2016 and 57.9% seen for 2015. The option count now stands at 13.7 million, of which 3.6 million could be satisfied by shares held in an employee benefit trust. The other 10.1 million represent 4.5% of the current 221.4 million share count. Something to consider with these options is their potential effect following the tender offer. The tender offer could purchase up to 22.3 million shares, which would leave 199.1 million shares in issue. So the dilution effect post-tender would increase to 5.1%. I guess that percentage remains acceptable. Certainly REC’s clients pay on time given the small (£147k) sum past due. Total trade receivables equate to 26.1% of management fees, which seems right to me given the business invoices on a quarterly cycle. Past years have seen this ratio as low as 19%, but I suspect the fluctuations could be due to currency conversions on the balance sheet date. REC’s working-capital cash generation is very sound anyway. I have seen other bloggers write about REC and suggest all the group’s cash is surplus to requirements. They ignore the group’s regulatory capital, without which the business could not operate. This is a bit weird. REC reclassified its product range back in November and I commented then that $0.8bn of client AUMe had effectively vanished last year. I don’t understand how total client money can differ depending on the product classification. Maybe there has been some double counting here, or as I speculated in November, perhaps some of the ‘old’ AUMe was not incurring any fees from REC. Whatever, it is all a bit odd and does not do REC any favours when it talks about AUMe ‘growth’. It is not obvious to me that the tender offer is a very good use of shareholder money. My sums in the Blog post above suggest REC is buying back the shares at a P/E multiple of between 14 and 15. Looking back, there was an opportunity for REC to buy back shares this time last year when the company first mooted returning cash to shareholders. Back then the price was about 25p, the post-Brexit effect on GBP had started and the firm could have projected the associated EPS benefit. The purchase multiple could have been 10 or less at the time and a buy back then could have done real wonders for EPS and the share price.. Essentially dithering for a year and waiting for the price to climb to 45p suggests to me this offer is more about Mr Record’s retirement planning than anything else. True, REC could declare a special dividend — but a tender offer gives Mr Record the additional flexibility of raising more cash by selling more than his basic entitlement. He could sell 20% of his holding through this offer if enough other shareholders don’t tender their shares. As far as I can tell, the only reason for ordinary shareholders to take up the offer is because they feel the price is generous and they want out. For what it is worth, I have voted against the tender-offer resolution. If the tender offer purchases the maximum number of shares, I reckon my £7.5m operating profit guess from the Blog post above would translate into EPS of 3.05p. Assuming the £13m remaining cash is not surplus to requirements, then the 45p share price would be valued at 14.8x. 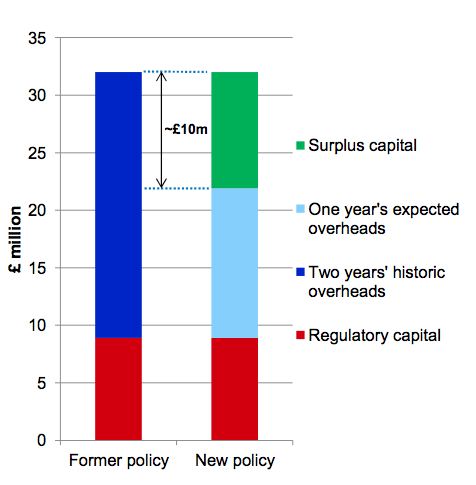 If the £13m remaining cash is viewed as surplus to requirements, then the multiple drops to 12.5x. Not too much to go through here as the main points were all revealed within the final results RNS. At least the results text did say the new ‘variation margin’ rules had not seen any early effect just yet. Liquidity in ‘stressed market environments’ has apparently become ‘less reliable’. Brexit may cause issues with REC and clients being subject to EU rules. That revenue would appear quite reliable, until the associated rules are ever relaxed of course. These are chunky payments for a business that has just delivered an £8m operating profit. For some perspective, the board at TFW receives about half of what REC’s board collects, despite TFW producing twice the annual profit. I see that staff continue to extract more from this business. I moan about this issue because the staff do not appear that capable pushing earnings higher by garnering new clients and keeping existing ones. Progress during 2017 was almost all due to the weaker GBP. 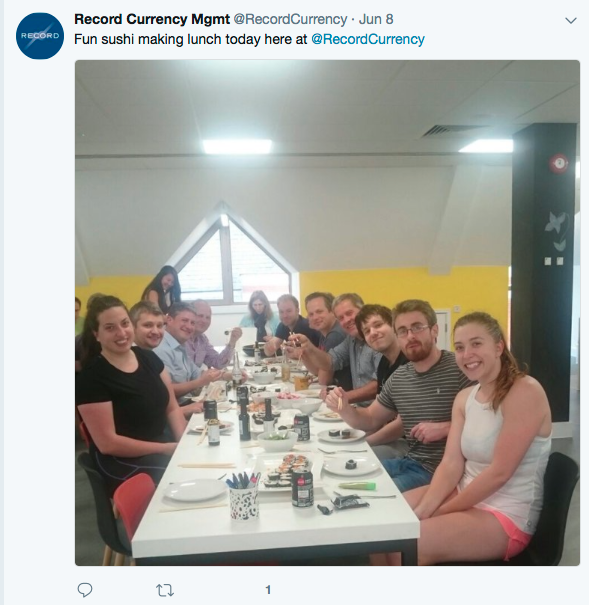 Let’s not forget that REC’s staff all enjoyed a 10% pay rise from May 2015, and that was due to staff pay apparently being below market levels. So pay remaining static after that was to be expected. Again, I don’t mind staff receiving pay rises, but REC’s lack of client wins is hardly justification for more catch-up payments. 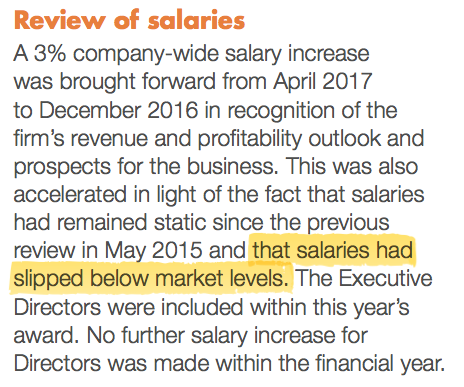 It seems to me REC’s staff are below-industry-average performers anyway, so probably deserve below-industry-average pay as well. 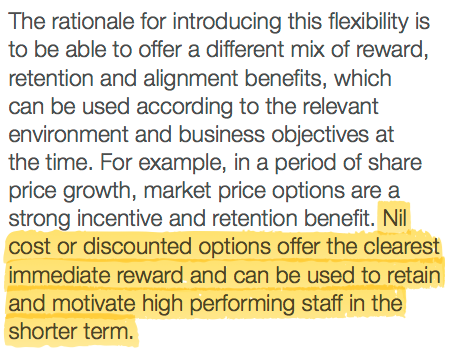 These next snippets suggest the staff wish to extract more value from the ordinary shareholder. 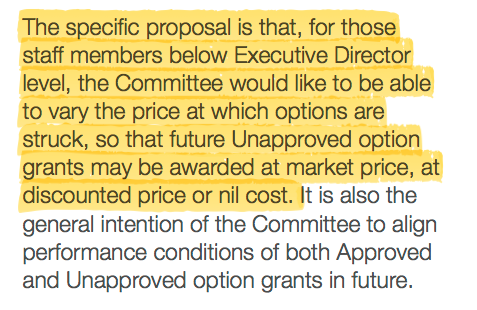 Essentially REC’s main staff-option scheme will now be able to grant options at nil cost, rather than at market price. So a can’t-lose gift to the employee at the expense of us ordinary shareholders. 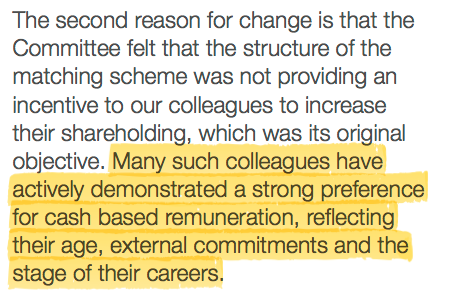 Note the reference to ‘shorter term’ — not a great example of remuneration-committee thinking. Oh dear. That is not a great advert for the shares, from the very people who know most about the business. This update was the latest in a long line of quarterly statements that did not reveal any significant progress. Total effective client assets under management (AUMe) advanced by $1.7bn to $59.9bn during the 3 months to 30 June 2017, and in sterling terms lost £0.5bn to £46.1bn. So yet another mixed quarter, with client money both coming in and going out. Among REC’s higher-margin strategies, Dynamic Hedging saw clients withdraw $1.1bn, although this movement was almost offset by Currency for Return and Multi-Product clients adding $0.9bn. Alongside other movements, the higher-margin strategies lost an overall $0.4bn to $9.4bn. I also see a Dynamic Hedging client has “notified its intention to switch” to Passive Hedging, the effect of which no doubt will be seen during Q2. So that is further higher-margin business lost to lower-margin Passive Hedging. At least it is business that is not lost entirely. 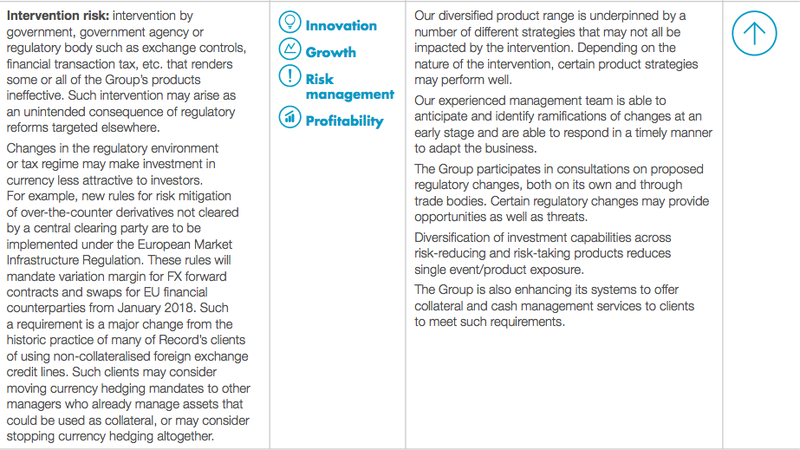 “We continue to engage with both existing and prospective clients as to their preferences in managing currency risk and opportunity, and in achieving their investment objectives. With our diversified product suite and our ability to tailor solutions to fit individual client objectives, we are confident that further progress can be made in the current financial year“. Just when ‘engaging with clients’ will actually translate into decisively adding new client mandates remains anyone’s guess at present. 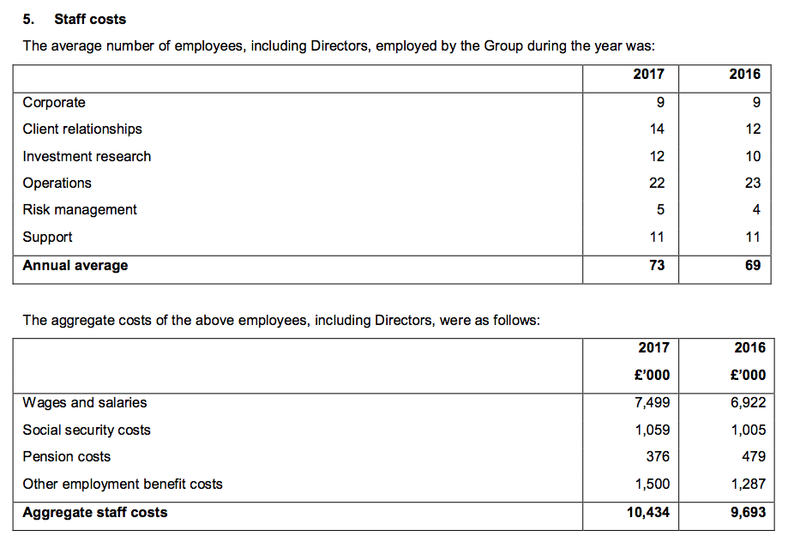 Less my guesses of £7,400k for staff costs and £5,600k for other costs as noted in the Blog post above, then less the 30% profit share (of £3,372k), I arrive at an operating profit of £7,869k. Taxed at 19% gives earnings of £6,374k or 3.20p per share (based on 199m shares in issue following the tender offer). With the share price at 43p, my P/E comes to 13.4. REC’s ‘surplus’ net cash position — i.e. cash excluding regulatory capital and third-party investments — is close to £14m or 7p per share following the tender offer. My P/E adjusted for this ‘surplus’ cash is 11.3. At least my 3.20p per share guess covers last year’s 2p per share ordinary divined and should perhaps fund another special payout. A 2p per share payout offers a 4.65% income at 43p. Total effective client assets under management (AUMe) advanced by $1.3bn to $61.2bn during the 3 months to 30 September 2017, and in sterling terms lost £0.5bn to £45.6bn. So another quarter where certain clients became fed up with one of REC’s higher-margin products. All told, Dynamic Hedging saw clients withdraw $0.6bn and Passive Hedging saw clients withdraw $0.5bn. However, those movements were offset by stock-market and exchange-rate gains adding $2.2bn to AUMe. “The theme of volatility in currency markets linked to political and economic uncertainty continues, and the consequent uncertainty provides opportunities for engagement with both existing and potential clients. We remain confident of making further progress in the second half of the financial year“. I can’t say I am surprised. This business is not shy when it comes to paying staff well for mediocre performances. 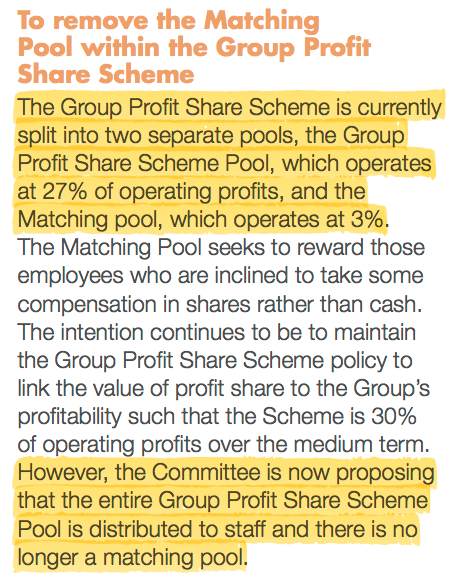 Less my guesses of £7,400k for staff costs and £5,600k for other costs as noted in the Blog post above, then less the 30% profit share (of £3,415k), I arrive at an operating profit of £7,969k. Taxed at 19% gives earnings of £6,455k or 3.24p per share (based on 199m shares in issue following the tender offer). With the share price at 43p, my P/E comes to 13.3. At least my 3.24p per share guess covers last year’s 2p per share ordinary divined and should perhaps fund another special payout. A 2p per share payout offers a 4.65% income at 43p.